The race to decide the next resident of the White House is well underway with an unbearable 14 months to go. Canada’s in the midst of its own national election, though mercifully it’s a much more condensed process. And with election campaigns come campaign songs. This isn’t a new phenomenon. Among the first popular campaign songs—in the US at least—was the little ditty “Tippecanoe and Tyler Too,” embraced by the campaign of William Henry Harrison and John Tyler in 1840. Historians will often point to this as the beginning of politicians using music to sway voters. More than 150 years later, politicians are using popular songs to tell voters who they are, what they believe in, how they’ll govern and to rally the base. Some have seemed like perfect matches—Bill Clinton using Fleetwood Mac’s “Don’t Stop (Thinking About Tomorrow)” was great for his first run for the White House in 1992. He’s continued to use the song at various rallies and speaking events, but there’s something darkly funny about the song’s promise of a brighter tomorrow for the former president who found himself impeached by one house of Congress for his dalliances with intern Monica Lewinsky. After all, for Clinton, tomorrow was always another day. In the early days of the 2016 campaign, Donald Trump has found himself in hot water with artists. Twice. First he angered Canadian hero Neil Young by using Young’s song “Rockin’ in the Free World” when he announced he was running for the Republican nomination for president. More recently, he’s managed to anger REM, enough to get the group to respond to his use of “It’s the End of the World as We Know It” in a highly entertaining Facebook post. Trump used the music when taking the stage at an event September 9 in Washington, D.C., in opposition to President Obama’s Iran deal. In polite language, the band took to Facebook to inform Mr. Trump they didn’t much appreciate his use of their song without permission, informing the businessman he was facing a $500,000 lawsuit, as was Ted Cruz, another Republican hopefully who also appeared at the rally. In an email to The Daily Beast, however, the language took a more colorful turn. But it’s important to remember Trump is not the first, and will certainly not be the last, to anger musicians for using their songs in campaign-related events without permission. *Back in 2008, the Republican Party irritated a handful of musicians ranging from the Foo Fighters and Heart to Boston and John Mellencamp, not just for the inclusion of Sarah Palin on John McCain’s ticket, but for using songs without permission. Jackson Browne received a public apology and undisclosed amount of cash from the GOP for the use of his song “Running on Empty” without his permission. Someone apparently didn’t know Browne is a staunch Democrat. At the time, the GOP told Billboard it would respect the rights of artists and not use songs during campaign events without first securing permission. Whoops. *One of the best examples of politicians not understanding metaphor and other artistic tools is the legendary dust-up between Ronald Reagan and Bruce Springsteen back in the ‘80s. Reagan was using Springsteen’s “Born in the USA” during his campaign—if anything, it’s a song about how America of that era was no longer living up to the ideals and promises of earlier generations, that hard work would be enough to become successful. Springsteen rejected a request from the Reagan campaign to use the song, but good ol’ Ronnie found a way to reference the New Jersey rocker’s philosophy in stump speeches anyway. In turn, Springsteen became an outspoken critic of Reagan, whose trickle-down economic policies and other conservative tactics are believed by many to have considerably weakened the middle class Reagan was supposed to support and embrace. Pat Buchanan and Bob Dole later made the same mistake and were similarly asked by Springsteen to stop using the song. There’s a fairly comprehensive list of musicians who have fought politicians over the use of their songs and won over at RollingStone.com. Recently, performers including Dan Mangan, Feist and The Sadies have joined an effort led by Torquil Campbell, lead singer for Stars, in the #ImagineOct20th series of events urging Canadians to vote against Conservative politicians. Four concerts have been scheduled as of the time this article was posted, from Sept. 19 through Oct. 1. 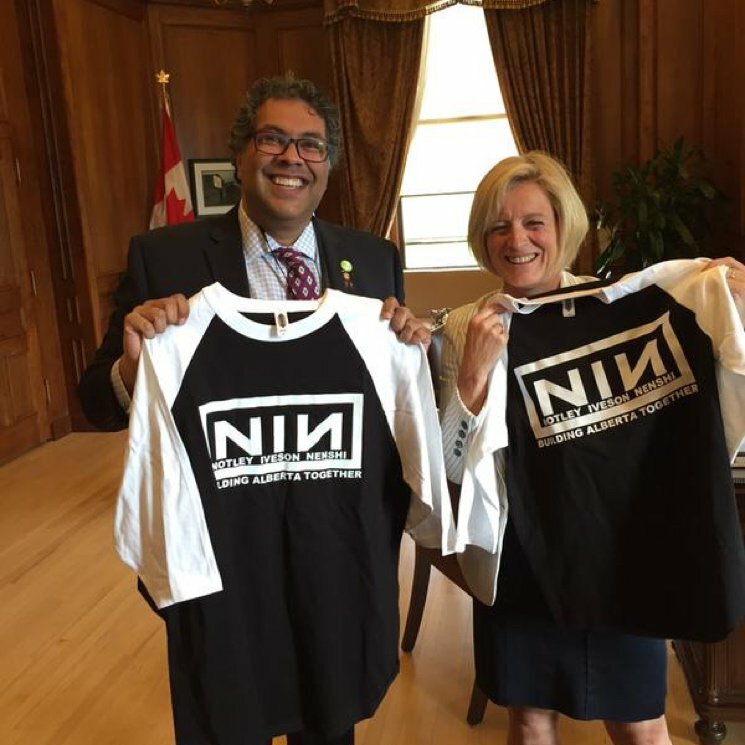 *And then, there’s the time Trent Reznor asked some Alberta politicians to stop using a logo exactly like his black and white NIN logo from the 90s on their campaign t-shirts. The Notley-Iveson-Nenshi trio was photographed holding a black t-shirt with a white logo on it, complete with the backwards N, and the tagline “Building Alberta Together,” back in November, until Reznor’s people asked them to stop. Calgary Mayor Naheed Nenshi told the CBC that the letter was “very polite” and that while the shirts were being sold by an independent party unaffiliated with the campaigns, he understood why Reznor objected. Alberta Premier Rachel Notley also confirmed receiving a similar letter, but no legal action was suggested in either document. Matt Elpern liked this on Facebook.